Wee Frolic : Ruth Donnelly and the Fantastic Dress. Ruth, serving early 1920s realness. Admittedly, you most likely do not know who Ruth Donnelly is, but chances are your great-grandmother would! She was a rather fantastic lady, to be frank. 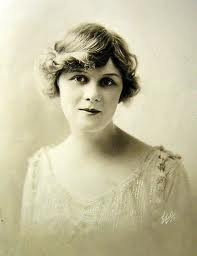 She was an actress of the stage, and later of film. The beak of her career was certainly in the 1930s and 1940s--and that is where this fantastic little piece of history comes into play. This particular dress was worn in the Paramount motion picture "Cross My Heart", a film from 1946 also starring fellow talented beauty, Betty Hutton. (Unfortunately the movie is credited as "Cross YOUR Heart" on this particular clothing website, but I have correctly identified this movie). The dress itself is a lovely green crepe, and in excellent condition--visibly showing little to no wear. What I absolutely love about this site is (albeit sometimes getting names of the movies wrong), each item comes with documented proof of where it has come from. It's a remarkable verification, especially if you are spending substantial money on an item worn by a bygone start such as this lovely lady. Part of the proof is the identification tag on the inside of the dress. This is a dead giveaway that the dress is not a reproduction, as back in the day Paramount had special tags sewn into every costume worn on set. The names of these actors and actresses were always printed on the inside with ink. 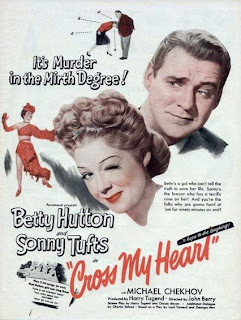 I've watched "Cross My Heart" and it is absolutely hilarious! In the film, Ms. Donnelly plays Betty Hutton's character's mother--a role which Ms. Donnelly unfortunately repeated in many films in the 1940s. Yet, the dress is a size 6...what mother do YOU know wears a size 6?! Impressive. Unfortunately, the movie has not been restored in technicolor, so it retains it's original black-and-white cinematography. You can actually see the dress being worn by Ms. Donnelly in this excerpt from "Cross My Heart" this I found on Youtube! It appears to be worn with two dress clips on either side of the breast where the fabric is pinched. These clips have been removed, and are not to be bought with the dress--but it certainly doesn't take anything away. Cheers to Ruth Donnelly, and this amazing dress!